Ok, so it took longer than expected to get another LO done.......If only life would show some consideration to my crafty needs....LOL!! If at first you don't succeed, try and try again!!.... These are words I drum into my kids heads all the time so I've taken my own advice and have once again used the Dusty Attic mood board as my inspiration. 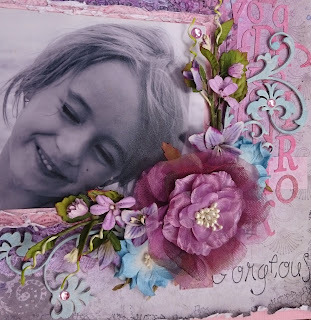 I added some mist sprays in various shades of pink and purple once the paste had dried and then used some distressed background stamps from Tattered Angels as a finishing touch to the background. I chose to use DA Corner Flourish #2 (DA0629) which I cut up into 2 separate pieces and tucked under my flowers. I first painted them with some white gesso and then lightly dusted them with some Broken China distress ink for a soft blue finish. I also used some DA Mini Vines (DA0370) to create the circle. I painted the mini rosebuds with 2 shades of blue Liquid Pearls and placed each one on a set of brass metal mini leaves I found in a local craft store. I used a Dusty in Bloom flower together with a Prima Mountain Lilly, which I also cut in 2, as part of my floral arrangement around the photo. Thanks for taking the time !!! I finally managed to get a new LO done. 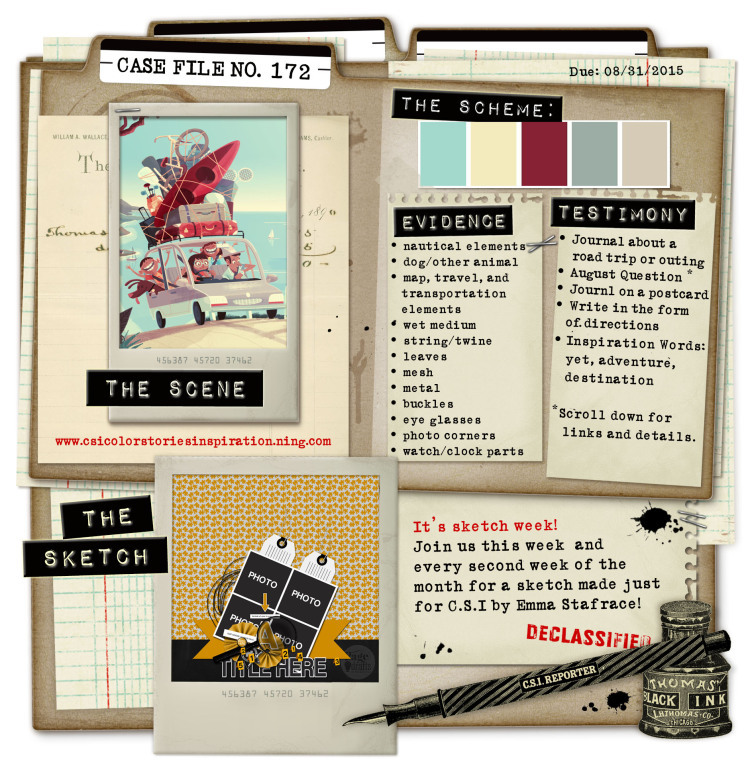 This one I did for the August Major Case File #172 over at CSI. I love that they've added a monthly challenge now. It's great for slow scrappers like me that never seem to be able to get a project done for any weekly challenges. 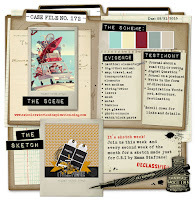 I absolutely love the colours for this month challenge, the ladies over at CSI really know their stuff!! I decided to keep it simple and did a straight forward copy of the sketch provided. I used all 5 colours as required. My two "evidence" elements are twine and leaves. "There used to be a time when the two of you were inseparable, but now it seems all you do is fight!! I sincerely hope that you find your way back to each other when you're older and need each other." 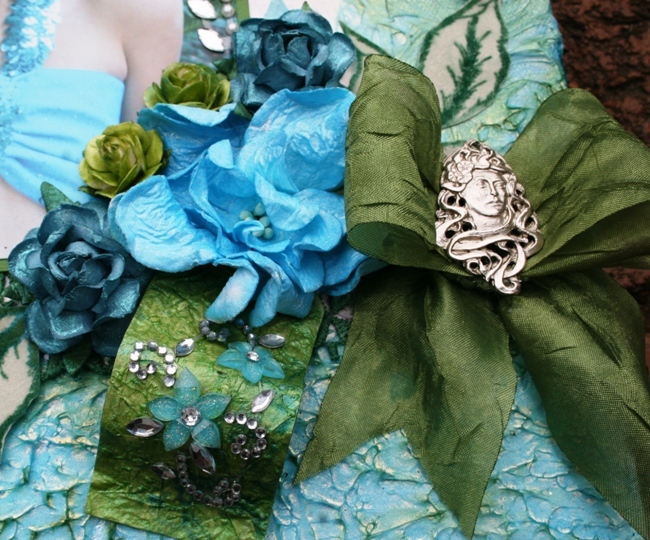 I'm so glad I finally got to use some of my Prima flowers that I've had in my stash for a few years now. I also tried a technique I found while browsing online. I can't seem to find the link again unfortunately but basically all you do is add embossing powder over wet textured paste and then heat with a heat gun from under the paper. I used some of my LSG powder which has a fantastic metallic finish. I really love the finished look and will definitely use the technique again. I have a feeling it may be from the LSG site. From the date of my last post (14th January 2013) you can see that it's been quite a while since I last enjoyed the pleasure of scrapbooking. My personal life got a little (actually a lot) complicated and indulging my creative side had to take a back seat. It's been almost three years since I last scrapped regularly and I'm most definitely feeling a little rusty. I've been doing some online browsing and am blown away by some of the new techniques and styles. I was always a fan of mixed media but it's really taken off now, much to my delight !!!! I've done a few pages the last month but haven't felt confident enough to start posting them yet. 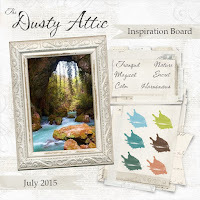 I decided that I would break the ice by signing up for the July Dusty Attic Mood Board Challenge. 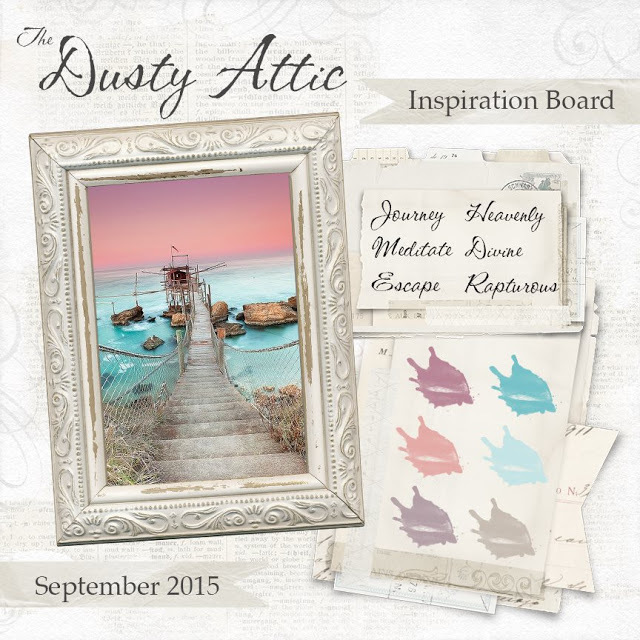 Dusty Attic were and still are one of my favourites and their new chippies are to die for!!! I cannot find a local stockist here in South Africa so I thought I'd try the next best thing......... $100 store voucher prize!!!!!! Can you imagine winning that....it would be like being in scrapbook Heaven!!! The pic is of my youngest two rascals taken about 4 years ago while on vacation. I remember the morning I took this pic......I must've sat watching them play together on the lawn in front of our chalet for about 45 minutes without a single argument or nasty jibe from either of them......In a moms world, that's a brief glimpse of HEAVEN!! 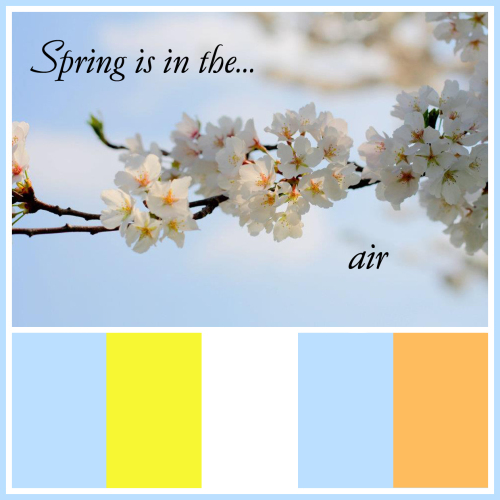 I absolutely love the colour pallet for this months mood board so this suited my tastes perfectly. I tried to incorporate the various shades of green with mists and inks and then of course added some of my (very old) Dusty Attic stash of chipboard frames and blooms. 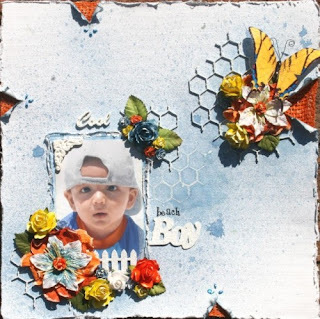 The design of the layout was inspired by a gorgeous LO created by the very talented Maryse Jolin who I stumbled upon while browsing online for some mixed media project inspiration. Thank you for taking the time to view my humble project. I hope to add a whole lot more in the near future . Wow, it's been almost a year since I last managed to complete a LO. My personal life has been a bit of a roller coaster ride of late but I'm determined to regain control. 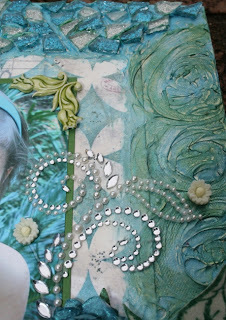 One way is to start doing things I love and enjoy which brings me straight to scrapbooking. 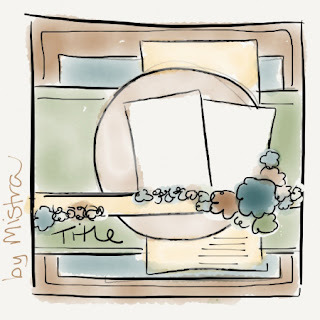 I decided to start slow and steady by selecting a sketch challenge to participate in. 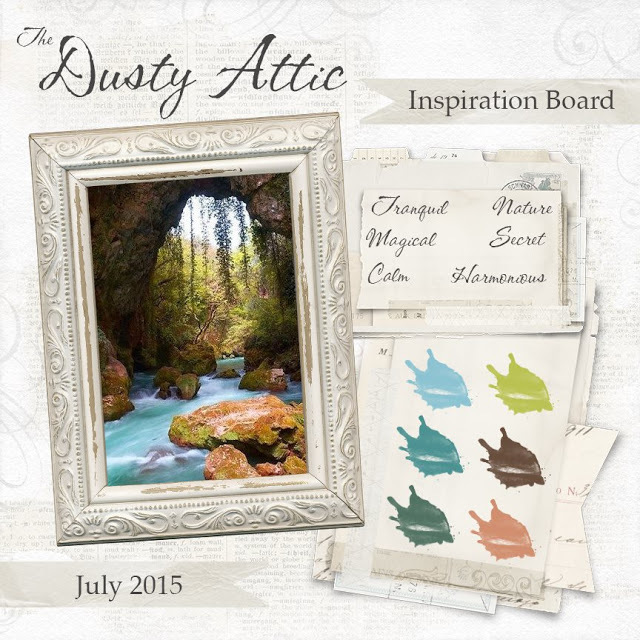 Dusty Attic is one of my favourite products and I have a ton of their chippies in my stash so I thought that would be the perfect place to start. The DA January sketch has lots of layers and I really enjoyed working with it. It also left a lot of room for your own personal interpretation and no specific piece was required so even though my stash is a year old I managed to use plenty of pieces. Here's a close-up of the flower cluster I made over the DA corner piece using a combination of some Prima florals and mini roses from Iamroses.com. For the circle in the sketch I decided to make a floral circle with the DA mini scrolls which I painted white and added some Sage Creative Inspiration Paints to the leaves. I then used a mini rose in the centre of each vine and arranged these in a circle on the LO. Thanks for having a look and I'm really glad to be back. I hope to complete a lot more LO's over the next few weeks. I may stick to sketch's for the time being until my creative juices are in full swing again. It also seems I have a lot of catching up to do technique wise but I look forward to learning getting my hands dirty again. It's been a while since I've been online due to having to deal with some urgent personal issues but I've really missed crafting and interacting with all the fab crafty ladies online so I've made a commitment to get back into the swing of things as soon as possible. I thought I'd get the ball rolling by posting a LO I did a while back but never got around to posting. It's one of my favourites for several reasons. Firstly, it was one of my first attempts of combining mixed media canvas work techniques with scrapbooking and secondly, I absolutely adore this picture of my DD and teal/turquoise are some of my favourite colours. To start I first covered the entire canvas with some gesso beceause at that point I wasn't quite sure which direction I was headed so I wanted a good foundation to work on no matter what. 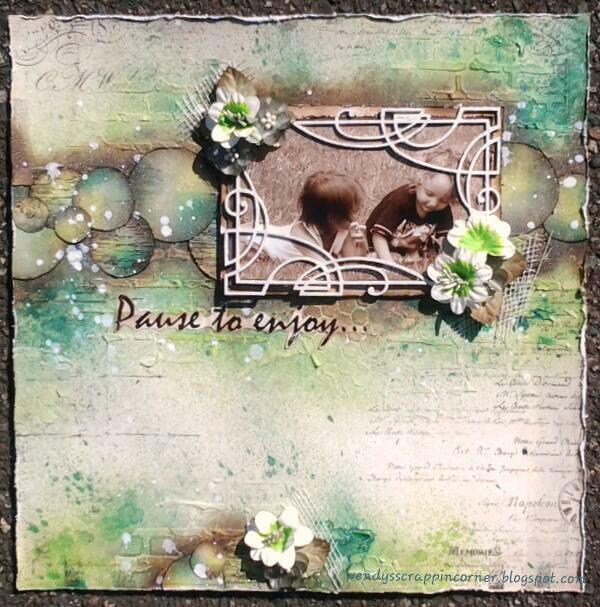 I then misted some Pink Paislee mistable pp's with some of the divine Lindy's Stamp Gang starburst sprays. I placed the misted pp in the centre of the canvas so that it could be used as a solid background for my photograph. I then really got my hands dirty and had a blast adding some textured molding paste to the canvas forming a border around the misted pp. I used my finger to create some swirls in the paste along the right border and then used a palett knife to tap the paste to create that really fantastic looking textured finish at the bottom of the canvas. I wanted to try something completely new and unique so I dug out some glass chips I had used for a one of my kids school projects and did a glass mosaic type finish along the left and top of the canvas. I did this by first adding a thick layer of molding paste to the canvas which I then embedded the glass chips into. I didn't want the traditional smoothed out finish you would normally do with mosaics so I left areas unfilled between the glass chips for a more distresed finish. Once the paste had dried I coloured between the glass chips using several colours of LSG mists, starburst mixed with gel medium to create a paint and just went to town....!!!! This really was one of the most fun projects I've worked on. After my background and canvas base was completely coloured and had dried I added my pic and some embellishments. I used the same LSG mists and paints to alter the iamroses flowers as well as this mini tag I made by adding wrinkled tissue paper to a normal mail tag with some gel medium. I then embellished the tag with some gems. 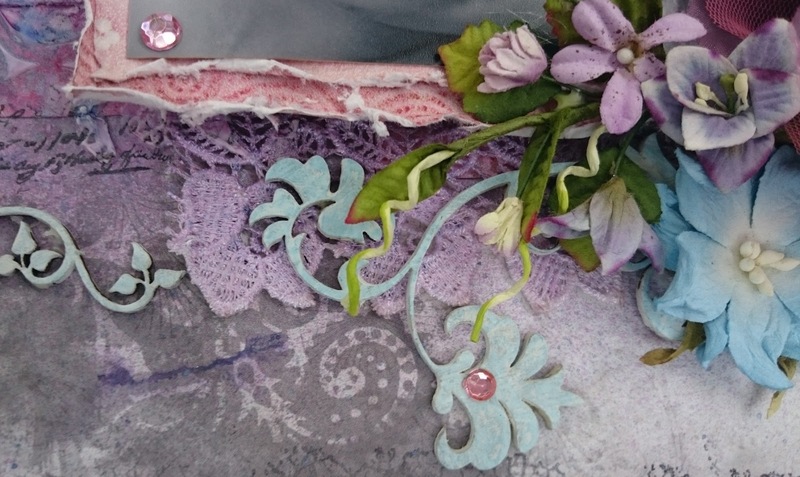 I also coloured the lace and white photo corners with the LSG paint. 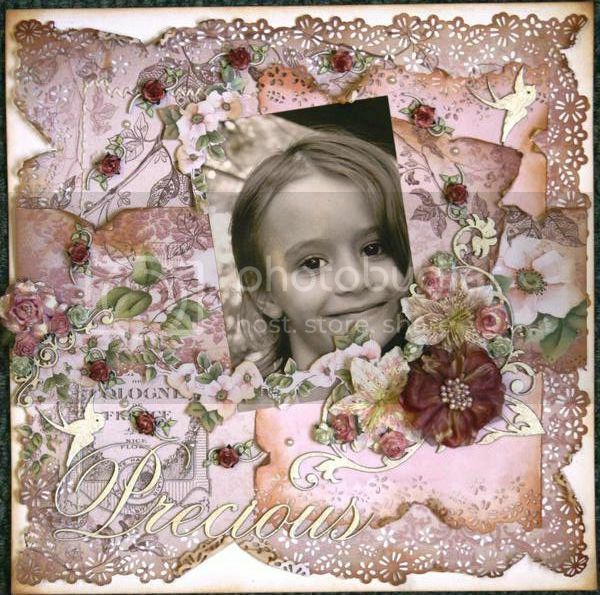 I finished my project off by adding some gorgeous Prima flourishes. I intend on trying a few more of these type projects in the near future because they're great fun to work on and it's a perfect opportunity to try new things you can't always get away with on paper bases. Rendezvous of Randomness First Challenge up and OPEN!! This picture of my youngest DS was just perfect for the launch of yet another STTG monthly challenge called Rendezvous of Randomness being hosted by my fellow STTG DT member, Adrienne Ford. Adrienne is an incredibly talented artist and is well renown for her brilliant background creations. Her colour blending skills are true perfection and I personally look forward to seeing every new masterpiece she creates. The Rendezvous of Randomness challenge is just that.......Random! Adrienne will select a different challenge every month which will be posted on the 21st and run until the 20th of the following month. Like all the other STTG Challenges there will be a $20 STTG STORE VOUCHER up for grabs in a random draw. 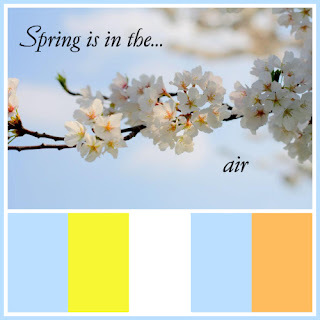 Her first challenge is this beautiful "Spring is in the air" colour challenge with a few extra twists. 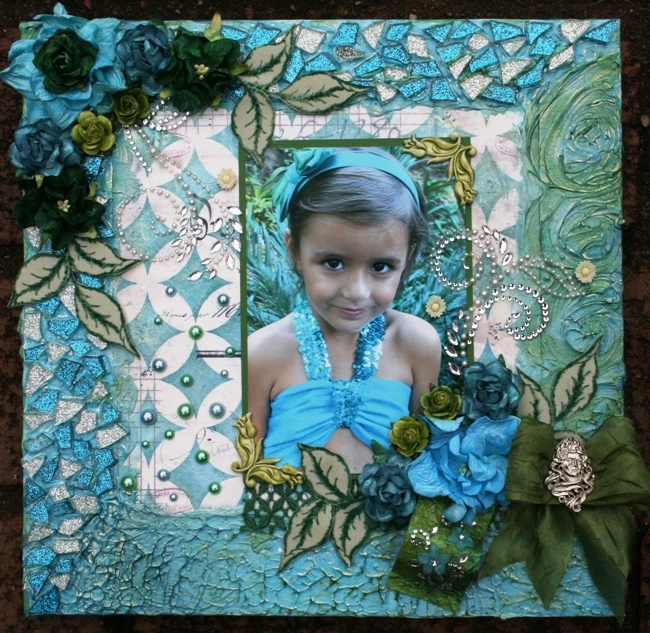 Use the five color palette and matching photo as inspiration to create your project. Try to get the colors as close as you can to the palette. However, please don't stress- the point is to just have fun! 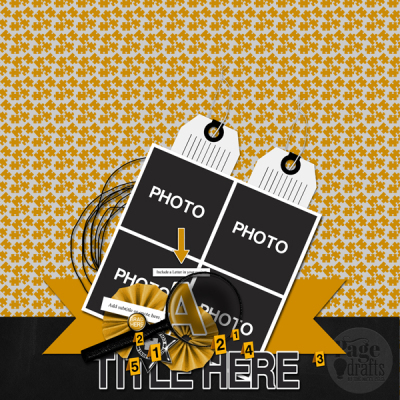 And because we all like a good twist here are some added things you can do to stand out in the gallery! Twist #1- Because Spring IS in the air, add a nature element to your layout- this could be a bird, butterfly, or whatever "nature" is to you. Please specify in your description what element you chose. Twist #2- Add a wet medium to your background. This could be paint, gesso, inks, dyes, mists, etc. For my DT challenge contribution LO "Cool Beach Boy" I used both twists. I used my Dusty Attic Chicken Wire piece with some gesso to stamp on the white cs which I then misted over with some homemade mist to create my bg. I also added the large yellow butterfly as the second twist. All the chippies on this were altered with some gesso which I layered on quite thick and then tapped with a finger to create extra texture and dimension. I hope you'll come and join in the fun!! One of my fellow DT members at STTG, Doris Widder, is hosting a monthly sketch challenge called 3D Sketches starting today. The challenge runs from the 14th to the 14th of every month. 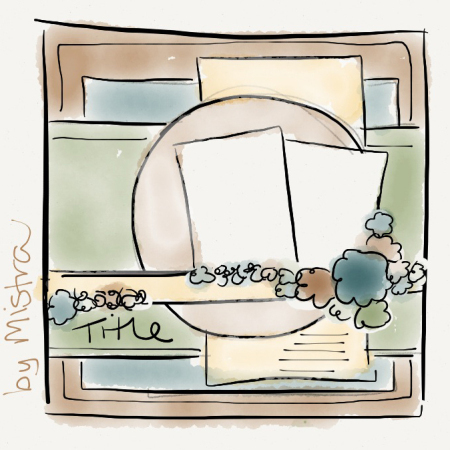 It's a sketch challenge with a twist....3 twists to be specific. 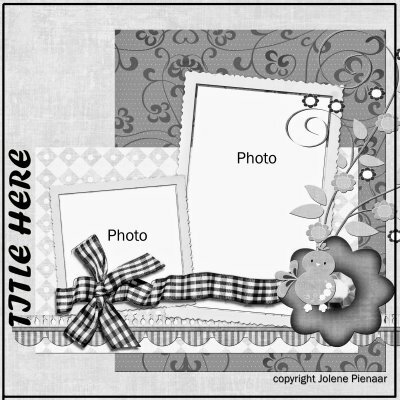 Doris will provide a sketch as well as a choice of 3 additional twists to use on your project. You are only required to use 1 of the three twists to qualify for the challenge. 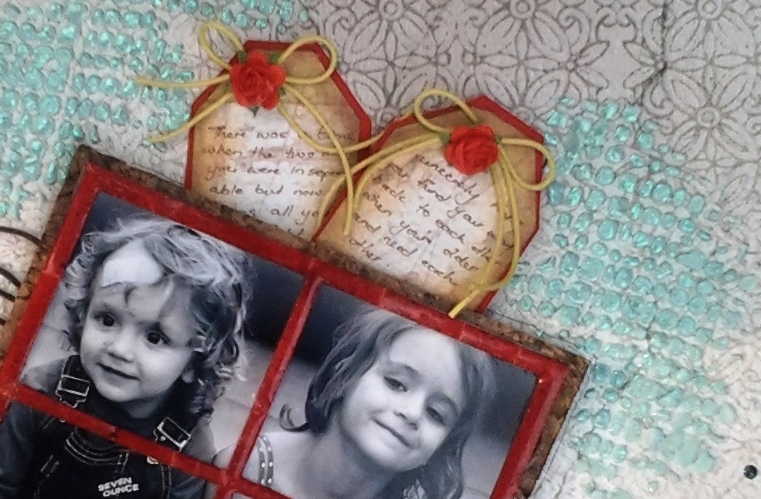 The three twists we were given to choose from are chipboard, embossing and distressing. I decided to use all three twists because they all seem to go together so easily. I heat embossed all the Dusty Attic chipboard pieces and used water distressing along with gesso for some extra punch. Let me tell you, UTEE is far more than just an embossing powder. This is one amazing product and definitely one of my all-time favourites under the Ranger umbrella. The versatility of this single product is actually mind blowing. 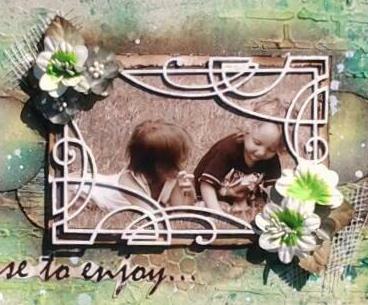 You can use it for regular embossing or to make incredible embellishments using the melting pot. As much as I love all of that I'd like to share my personal favourite techniques using this product which is creating backgrounds. I have three effects I'd like to share with you, two of which don't require a melting pot so sit back and enjoy. 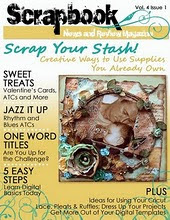 Step One: For my demonstrations I'm using an ATC size background base on some recycled cereal boxes cut down to size. 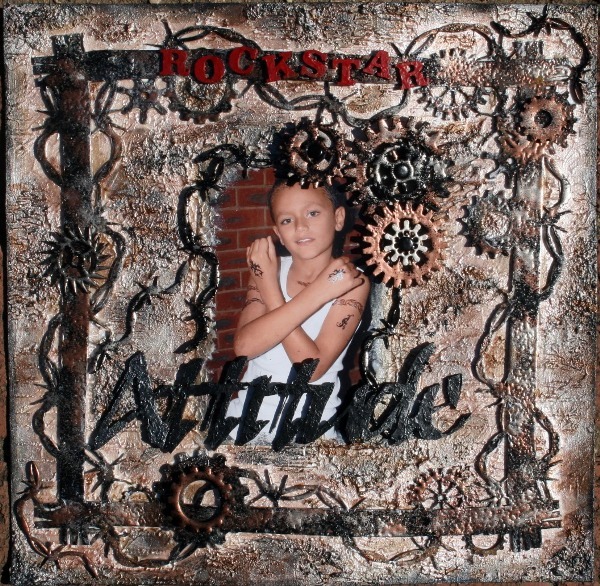 Apply embossing ink to the entire surface area, add UTEE powder and emboss using the black UTEE with your heat gun. Using the black UTEE as a base provides a great contrast against the metallic colours I'll be adding. You will need to repeat this step 3 times for a nice thick and solid base. Step Two: While your black UTEE is still hot start adding some of your first metallic UTEE which is the platinum in my sample. You need to only add a very little in small areas around your base. You'll notice that the UTEE starts melting almost instantly. Use your heat gun to melt any powder left. Step Three: Using a toothpick while the embossing powder is hot and almost liquid like on your base start swirling it around mixing the metallic powder with the black creating a marble like effect. If you feel it starting to harden then just zap it with the heat gun again long enough for it to melt again. Step Four: You can leave your project as is or you can add a second metallic colour to the mix as I did using the bronze UTEE powder. Again swirl the melted bronze powder around with the toothpick creating a multi toned marble effect....isn't this just gorgeous? A practical use for this technique would be to alter some chipboard lettering or shapes. This would make a perfect accent to a layout and just look at how delicious that marble effect looks. Step One: For this technique you will need a melting pot and three or four different colours of UTEE. You can use whichever colours you like according to your own personal taste. Melt just a little of your first colour in your melting pot and once it's completely melted drizzle it onto your non-stick craft mat in a random pattern as shown above. Step Two: If you have project pan then you can go ahead and use a new pan or simple clean out your pot and add the second colour UTEE. Again let it completely melt and then drizzle that over the first layer. Step Three: I added a layer of black in between steps and then as my final layer used some of the pearl UTEE. Again melt your UTEE and drizzle over the previous layers. Step Four: Once the UTEE is completely dry, which only takes a few seconds, you can lift your drizzle sheet from your craft mat and add it to your background base. If you're using it on a ATC, card or tag then just cut down all the excess bits. You can attach it to your base using some gel medium or a glue that will dry clear. I made my pattern quite condensed but you can obviously spread it out more for a less bulky effect. Step One: For this technique you'll need to start with a black base as we did for the first technique. Three layers will provide a nice thick and solid foundation. Step Two: Now add two more colours to the base while the Black UTEE is still hot. Use your heat gun to melt any excess powder. Step Three: Now for the fun part, using your heat gun very close to your project surface and at various angles start blowing the melted UTEE around so that peaks begin to form. If you use the metallic powders you will notice how patterns start to form in the direction that you blow the melted UTEE. Step Four: Continue doing this until you have created the pattern you like. It's difficult to show the peaks and valleys in a picture but if you run your finger across your project surface it will definitely feel the uneven surface and the patterns make for a gorgeous finish. 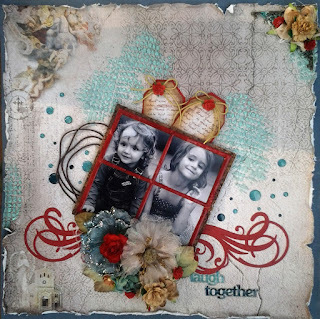 These are just three of my favourite background technique using UTEE. Each has a unique finish and can be adapted to whatever project you decide to use it on. 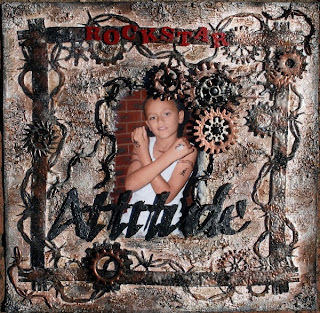 Chipboard and ATC's deliver some of the best results. 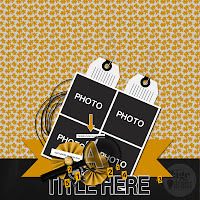 The Drizzle technique is perfect for a layout background too. Mix and match your colours and above all, have fun. I've started a new monthly challenge over at STTG called Getting Messy D.I.Y. Style. This challenge is all about creating homemade embellishments and/or incredible backgrounds for your scrapbook layouts. The aim is to hopefully inspire you to step out of your comfort zone and explore new techniques and styles or fine tune some of those you may have already tried. It's important to note that the theme based tutorials and techniques are OPTIONAL and not required to be eligible to enter the challenge BUT if you do use them you will be given an EXTRA VOTE. There are 2 options available to qualify to enter the challenge. Create your very own unique scrapbook layout background paper using embossing, stencilling, masking, stamping, misting or any other creative techniques. 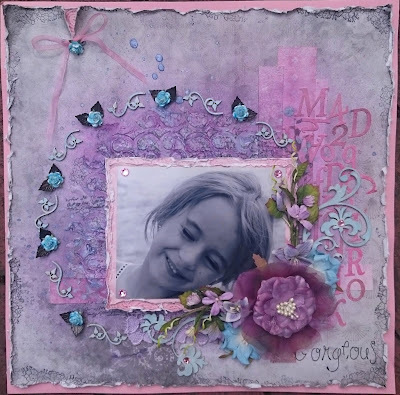 Textured Madness Technique Option: To earn an EXTRA VOTE use some molding paste, textured pastes/gels or gesso together with any type of colour medium to create your background. This stunning piece was done by Adrienne using molding paste and micro beads to create the butterflies. Adrienne used some homemade mists as her colour medium. Typical of Gerry's beautiful whimsical style, she created this adorable Easter layout background using a combination of mists, fussy cuttings, molding paste and puffy paint. 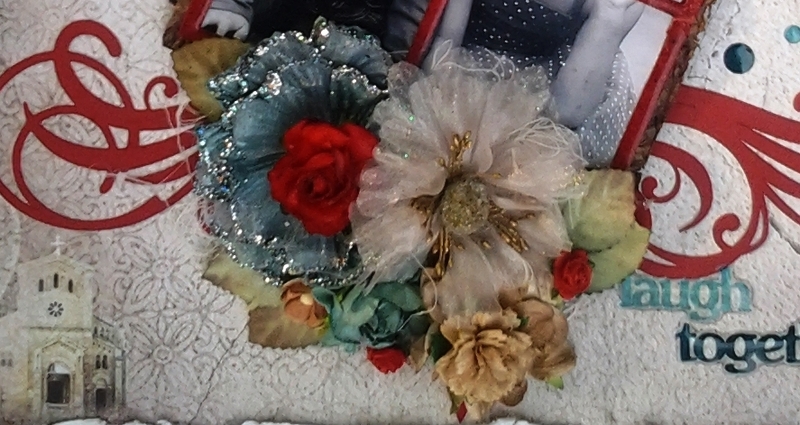 Your layout must have at least one homemade embellishment clearly visible. This can be anything from a homemade paper/fabric bloom, pearl/rhinestone flourishes, polymer clay molded embellies.... The sky is the limit here. As long as you made it yourself and it's clearly visible on the layout, it counts. Textured Madness Tutorial Option: To earn an EXTRA VOTE make a textured paper flower using the following tutorial. In the tutorial I used alcohol ink as a colour medium but this can be substituted for any other colour medium. Themed techniques and tutorials are OPTIONAL and NOT required to be eligible for the prize. Using the techniques and/or tutorials will however earn you one extra vote. Please post your entries on this thread as well as in the main gallery. When posting to the main gallery please include "D.I.Y. #1" in your title. Winners wil be selected by the STTG design team and fellow contestants. Please send me a message on the 8th May with your TOP 2 votes. You need not vote for yourself as you will receive a vote for voting. Winners will be posted on the 9th May. Tracy will contact the winner with the STTG Gift card details soon after the winner has been announced. STTG #3 Challenge - $50 in pizes up for grabs!! ends at midnight on April 30th pst!! This month we're featuring images from Hannah Nicole Portrait Studio!! You can find her tutorials here!! One of Wendy's NEW Stamp Techniques.....yes, that's me!! You can find her tutorial here!! Please put STTG_3 (exactly as shown) in the tags... so we can find you in the search!! Don't forget to checkout the STTG STORE. These gorgeous new Dusty Attic Blooms have just arrived and they're selling fast!! You'll find all sorts of hidden treasures in the store and don't forget that all US orders max out at $5.45........BONUS!!! !